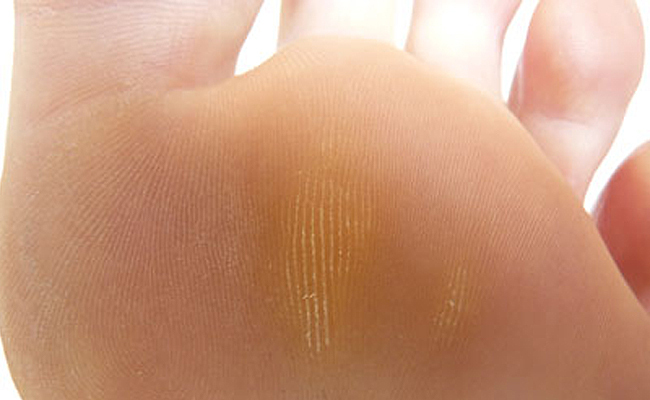 Corns and callus are very common conditions that at some time or another develop on most peoples’ feet. They are essentially caused by the skin’s reaction to pressure and/or friction. Skin cells are produced more quickly than usual and a build up occurs. Skin can fell rough/ rubbery /hard or spongy in the case of callus and when the problem occurs in a concentrated area, a corn can be produced. These are common underneath the foot or between toes. Corns can also develop on the top of the toe joints and, considering they only look so small, they can cause you a great deal of pain. People even alter the way they walk sometimes in an attempt to minimize the discomfort! Both corns and callus can be dealt with quickly in the clinic and I am happy to give you lots of advice to try and avoid their re-occurrence. Files and creams are also available to buy from the clinic so that you may treat the problem areas yourself at home. A hard growth of thickened, glassy skin on the ball of the foot. Increased discomfort in thin soled and high heeled shoes. Patches of callus can feel warm when you are walking on them.